Imagine autonomous, self-sufficient robot collectives that can adapt their controllers autonomously and self-sufficiently to learn to cope with situations unforeseen by their designers. As one step towards the realisation of this vision, we investigate on-board evolutionary algorithms that allow robot controllers to adapt without any outside supervision and while the robots perform their proper tasks. 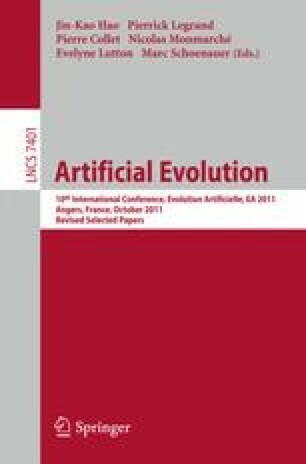 We propose an evag-based on-board evolutionary algorithm, where controllers are exchanged among robots that evolve simultaneously. We compare it with the ( μ + 1) on-line algorithm, which implements evolutionary adaptation inside a single robot. We perform simulation experiments to investigate algorithm performance and use parameter tuning to evaluate the algorithms at their best possible parameter settings. We find that distributed on-line on-board evolutionary algorithms that share genomes among robots such as our evag implementation effectively harness the pooled learning capabilities, with an increasing benefit over encapsulated approaches as the number of participating robots grows.